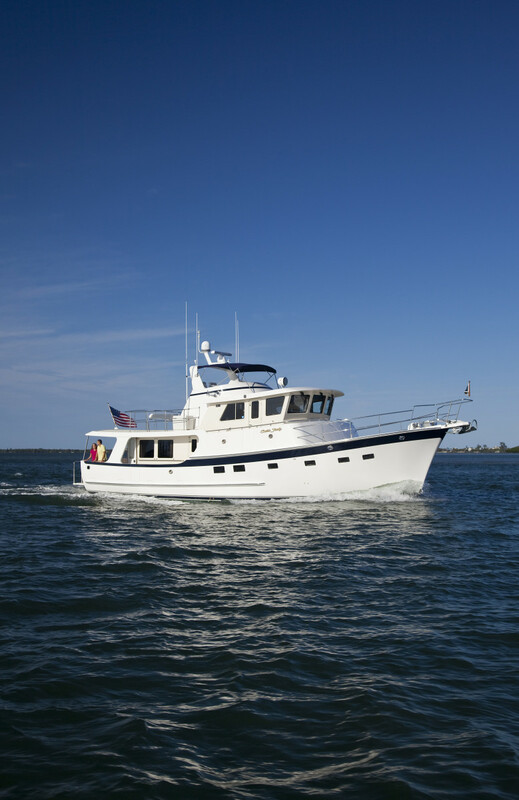 The new Krogen 52 pilothouse trawler is a harmonious blend of efficiency, comfort, and sea keeping ability. It was a clear, sunny September morning when I first set foot on the new Krogen 52. It was just a little over a year earlier that I flew to Taiwan to tour the Asia Harbor Yacht Builders facility in Kaohsiung, Taiwan, where every Kadey-Krogen yacht has been built over the last 25 years, and saw the meticulous work being done to prepare the plugs for the hull and deck molds in which the new K52 would be fabricated. My anticipation was palpable, and I was keen to walk the foredeck and climb to the flybridge helm on a molded part that came from the plug I had walked beforehand. I snapped pictures as I walked down the dock, appreciating the similarities between the K52 and it’s larger sibling, the Krogen 58. 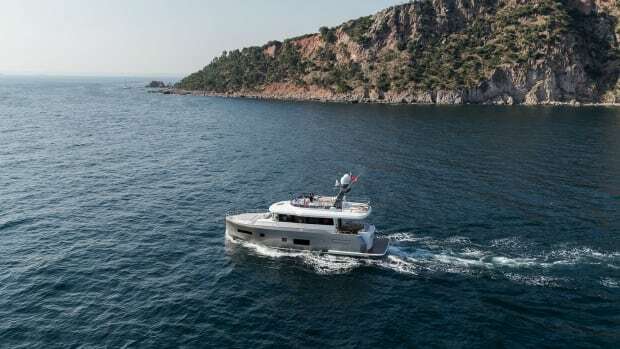 From the trademark springy sheer of the tall bow to the stout-looking raised pilothouse protected by a large Portuguese bridge, the design is distinctively Kadey-Krogen. The large, well-crowned flybridge deck extends right out to the sides of the boat, providing protection for the starboard side deck, while the aft extension of the boat deck protects the large aft deck beneath it. The beauty and functionality of the design lines were at once obvious. What was not immediately obvious was the tremendous amount of work that went into the design and fabrication of this entirely new model. I covered the project’s design concepts in “The Curtain Rises On Kadey-Krogen’s Latest Cruiser” (PMM Nov./Dec. ’10 issue), how the hull would be constructed in “Krogen 52 Blends Craftsmanship And Precision Design” (PMM May/June ’11 issue), and how the equipment would be installed and the interior finished in “Ready To Launch: Krogen 52” (PMM Nov./Dec. ’11 issue). When you dig this deeply into the creation of a new boat, the resulting process creates a series of pictures in your mind about how the boat will look, how the spaces will work together, and how the owners will respond to the reality of the trawler they bought based on nothing more than detailed drawings from the builder. I boarded from the massive swim platform, and entered the aft deck through a large transom door, but could just as easily have entered through one of two side-boarding gates, the port gate serving this large, spacious area, and the starboard serving the side deck. All three were furnished with stout stainless steel hardware, the same highly-polished 316L variety used throughout for safety rails, the two posts supporting the after end of the boat deck, and the custom hawse holes that feature twin molded cleats that make it easier to tie and adjust multiple lines, or a line, and a fender without overlapping. For convenience, a Scandvik hot/cold freshwater handheld shower is located just inside the door, so rinsing off the salt and sand can happen easily on the swim platform. The handcrafted standard teak planking under foot was meticulously laid and bedded, perfectly lined up across the large lazarette hatch in the center of the deck. 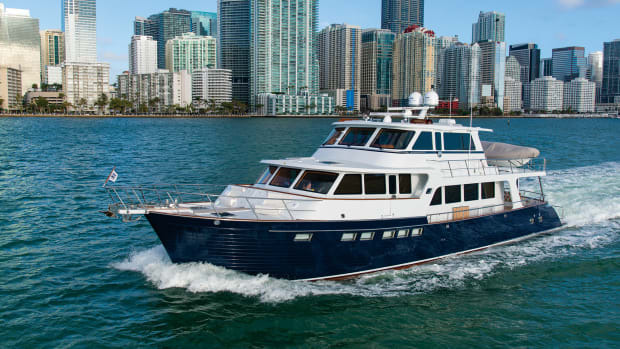 Two large freeing ports, one in each corner, as well as several on the side, help ensure that the aft deck will drain quickly in case of boarding seas—a requirement for the boat to have a CE Category Ocean A rating. One also makes a handy, low opening for neatly running the shorepower and TV cords from the inlets on the port side of the aft saloon bulkhead to the dock pedestal. There was a freshwater bib and a wash-down connection in this area, as well. Walking down the side deck to starboard, I discovered a recessed and vented fuel catchment with a dedicated fill port for each of the four tanks aboard. Well-placed, and beautifully ground and finished, stainless handrails and deep bulwarks added a good grip for security when moving fore or aft under way. Where the teak planking ended and the GripTex non-skid-finished fiberglass decks begin, I passed the Dutch-style door to the galley and ascended the six stairs, passing the starboard Dutch-style pilothouse door and one of two high boarding gates, to the wing control station at the starboard corner of the Portuguese bridge walk-around deck. There are two wing stations giving excellent views down the sides for easier handling, each equipped with engine start/stop buttons and throttles, and ABT TRAC thruster controls. Four large lockers accessible from the walk-around deck are provided to access the considerable stowage available within the Portuguese bridge structure. Excellent low stainless steel handrails topped the bridge, which was also partially protected overhead by the wide brow that extended forward over the reversed pilothouse windows. Access to the foredeck is through twin thick-section door panels, which are flanked by two molded bench seats with lockers for dock lines, hoses, and maybe a spare shorepower cord. The wide, clean foredeck is all on a single level and, along with the pulpit, is well protected by significant bulwarks and by welded stainless steel safety rails with intermediate rungs to prevent anyone from slipping over the side. A second set of fresh and seawater wash-down outlets, as well as a freshwater bib and inlets for shorepower and TV are found here, adding flexibility when power may be too far away from the aft deck. The heavily-molded bowsprit is configured with two stout rollers, and like the hydraulic Maxwell HWC 3500 windlass, is set up above the deck level, where the foot switches were mounted on the boat I tested. This heavy-duty horizontal unit has dual chain wheels and a single rope gypsy, covering virtually any combination of anchoring needs. To port, a watertight Freeman Marine anchor locker deck hatch opens to reveal molded steps down into the chain locker, which is divided by a substantial structure to keep rodes separated. The chain locker is reinforced well, with aramid fibers, creating a strong collision bulkhead. 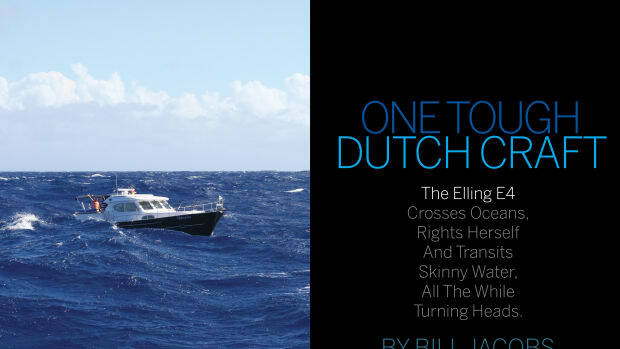 Stepping back through the twin opening doors, I continued around to the port side, past the other wing control station and the Dutch-style pilothouse door, and climbed the five stairs to the flybridge deck. A standing rail across the width of this deck separated the area usable for entertaining from the area dedicated to the boat deck. The boat I tested had a Steelhead Marine ES1200 davit with hydraulic four-function crane and pedestal base. 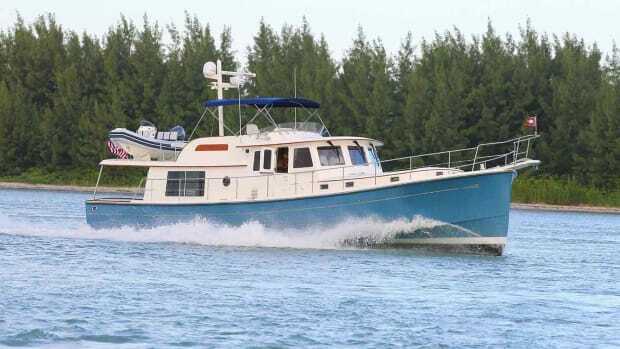 Although it was not fitted at the time of our test, this boat would receive a radar arch in lieu of a mast, leaving room on the starboard side for a built-in fiberglass summer kitchen cabinet housing a SeaStar SSBQ-24 propane barbecue and a sink. There was plenty of storage beneath for grilling equipment, or an Isotherm Cruise 85 refrigerator. Just to starboard, and hidden by the upper helm structure, was an ABYC-compliant locker housing two 20-gallon LPG bottles. Three steps led up to the raised helm station and an L-shaped bench with a table. The helm station included a tall Pompanette chair with a foot stand, a destroyer-type Edson stainless wheel, and a large console that included a flat for the engine controls and gauges, as well as the thruster controls, and a forward canted section large enough for twin multi-function screens. As I descended the stairs, I discovered a vented locker that accessed voluminous storage beneath the helm deck structure. Entering the pilothouse through the port side door, I particularly appreciated the visibility from the helm, which swept through nearly 270 degrees. There were great wood handrails atop the chart table (with chart drawers below) immediately to my left and right atop the raised bench seat/watch berth, as well as on the far side of the helm console, which stretches the full width of the pilothouse. The table serving the bench seat will convert to a double for the off watch. The walkway between the helm and the raised bench seat aft was carefully created to allow room for a two-helm chair with plenty of room to pass from side to side. The main breaker panel was positioned just to port of the custom wood (stainless is standard) steering wheel, beneath the chart table, protected by opening doors with slightly tinted glass inserts for easy viewing and low glare. Per ABYC recommendations, the panel is locked by bolt and key, making accidental access just about impossible. Two separate panels are found to starboard for the marine electronics switches. The woodwork in the pilothouse was flawlessly joined and finished teak (cherry is available), with a hand-laid teak and spruce sole. Two teak overhead grab rails were positioned for best stability assistance under way. The electronics console is spacious enough for the largest screens you can imagine, and there is an overhead electronics console in case your budget and imagination are larger than the lower space available. Panels for the generator, holding tank indicator, and SeaLand TankManager are mounted at the end of the bench seat, for quick visual access when using the stairs leading down to the saloon. There are six straight steps with real household risers and treads leading down to the main cabin level, which includes the galley and the saloon. 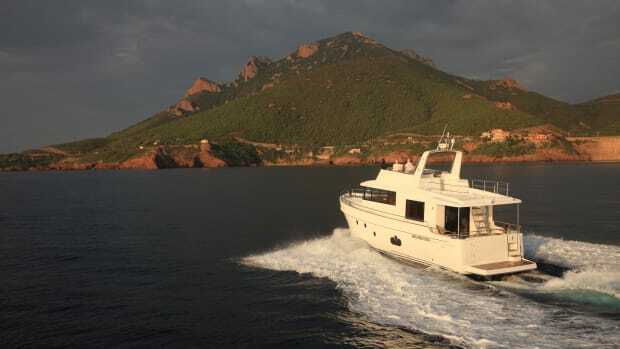 Large powder-coated Diamond Sea Glaze windows, six of which slide open and include screens, surround the entire area, with excellent views on both sides and through the aft bulkhead starboard corner. 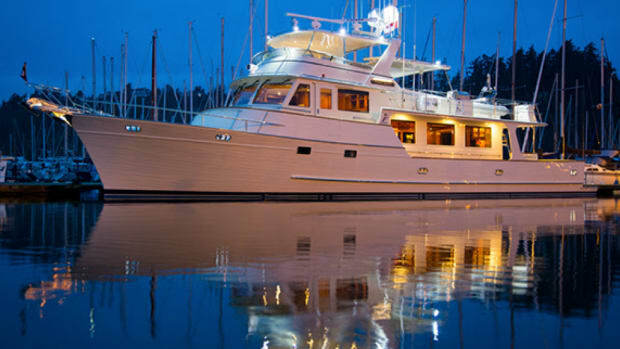 The welded aluminum Diamond Sea Glaze double door leading to the aft deck is weather-tight, and there is a hidden screen door included for times when natural ventilation is desirable. 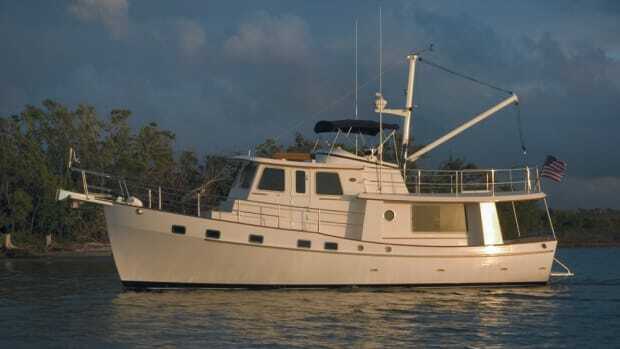 Teak cabinetry, window valences, and built-in furniture matched the high quality of fit and finish I observed in the pilothouse, exuding a traditional warmth that is fitting in the K52. For a contemporary touch, Corian (or optionally, granite) graces the tops of numerous lockers and counters throughout the boat. The galley is replete with stainless steel finish appliances from GE and Jenn-Air as standard equipment, as well as with a Viking LPG range and oven. Storage cabinets are numerous above and below the main countertop, and the space between seems perfect for bracing oneself against the movement of the boat underway. Having a Dutch-style door opening on the starboard side deck adds the possibility of excellent ventilation when the galley is heating up, as long as it is used with an awareness of prevailing conditions. Four steps down lead to the accommodations level, where I found myself immediately in an open office area well equipped with a large desk, book shelves, and plenty of drawers, some dedicated for filing. Two large opening Manship ports with screens were nicely set into the teak ceiling strips on the hull side. Just ahead, an ASKO washer/dryer was neatly installed in a locker in the companionway. The boat I tested had the standard layout of a large master forward with an island queen berth, and a guest stateroom to starboard, across from the office, both with private access to head compartments. There are other layouts available, including one with a mid-ship master. Vimar CO detectors are standard. Whether you opt for a standard single or optional twin John Deere diesels, there is ample space in the engine room for underway routine maintenance and regular checks. Inside the watertight door at the forward entrance, headroom is 6 feet, 3 inches and progresses to 5 feet, 9 inches further aft. Access to the strainers, fuel/water separators, and engine fluid checkpoints are all near the front of the compartment. The standard Northern Lights genset is located to starboard and there is enough space for a second genset to port. 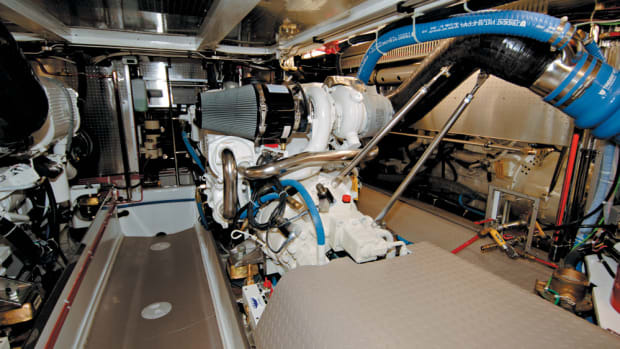 The single engine installation has 16 Lifeline AGM batteries: 4 being 12-volt DC units ganged in pairs—making 24-volt DC—for engine and genset starting, and 12 being 6-volt DC—300Ah units devoted to 24-volt DC ship’s service. Batteries are enclosed in fiberglass boxes with ventilation per ABYC guidelines. Electrical service includes Balmar alternators with external regulators, 190 amps and 80 amps, respectively. Charles Industries’ 60-amp battery charger and an isolation transformer are also part of the electrical equipment, along with a Magnum Energy 4000-watt inverter/battery charger. The insulated copper plumbing runs and the tinned wiring electrical runs were neat and clean—some of the best available. Pyrotek SORBERFLEX sound insulation was used extensively to attenuate engine room noise and vibration, which showed up in my measurements. That perfect September day I first stepped aboard the K52 also proved to be a light-winded day, not exactly the kind of conditions in which you’d like to test a bluewater-capable trawler. Yet run we did, verifying the numbers that Kadey-Krogen publishes on their website: a top speed of 9.6 knots at 2350 rpm, burning approximately 10.2gph, a cruising speed of 8 knots at 1500 rpm, burning roughly 3.7gph. At ocean cruising speeds of 7 knots, Kadey-Krogen estimates a range of 3,300nm with a 10-percent fuel reserve. At coastal cruising speeds of 9 knots, their estimate is 1,700nm. Sound levels in the pilothouse, recorded with the doors and windows shut and the genset running, started at 55dBA at idle, rose to 61dBA at 8 knots, and ended at 67dBA at wide open throttle—very quiet, indeed, especially for an empty boat without any carpet or owner’s possessions aboard. At one point, I ducked down to the saloon and measured 67dBA at 8 to 9 knots, still a realistic level for those who might be cooking or relaxing underway. Interestingly, Kadey-Krogen personnel ran K52 hull number three, powered by only one of the boat’s twin John Deere 121hp diesels, to simulate performance with one engine offline, and found that at 2000 rpm, fuel burn was 3.7gph and speed was 7.5 knots. Handling underway and around the docks was notable, but then again, our conditions were near perfect. Not being satisfied with our near-calm water conditions, I called Mike Warren, the owner of Suite Judy, K52 hull number two, and asked about his delivery in the spring of this year. One of Warren’s crew members compiled a video of highlights from the trip, so you can see the great fish and the large waves at: www.kadeykrogen.com/videos/playvideo.php?id=33. Watching all the fun, they had made me sorry I didn’t get to take Warren up on a delivery ride this year, but it was also a testament to the efforts of the entire Kadey-Krogen and Asia Harbor Yacht Builders team members, to see the idea that was once only on paper become a reality resulting in the efficient, comfortable Krogen 52. HOLDING TANK 125 U.S. gal. GRAY WATER 125 U.S. gal.